The Exchange Web Services module in Decisions allows you to access Email, Contacts, and Appointments in Microsoft Exchange servers. It can communicate with Exchange server versions from 2007 to 2013 SP1 and also integrates with Office 365 Exchange. Available in Decisions Version 5.4.0 Revision 60393 and later. To install the Exchange Web Services module, navigate to the System > Administration > Features folder, location the Decisions.Exchange module in the list of Available Features, and select the Install action. All of the flow steps in the Decisions.Exchange module take an ExchangeServerDefinition object as an input parameter. This object can be created once and reused in multiple steps, simplifying the Exchange server connection setup to a one-time operation. User Email Address	. The SMTP address (e.g. user@domain.com ) of the account that Decisions should use to perform operations on Microsoft Exchange. This can be the user whose Inbox or Contacts you want to get or update, or it can be a user that has permission to access folders across multiple email accounts. Exchange Server Version	. Select the version of Exchange that Decisions will be communicating with. For Office 365, select the newest version, Exchange2013_SP1. Offset	- How many results to skip. Use 0 to retrieve results from the start of the results. This parameter is used to allow pages of results to be retrieved. 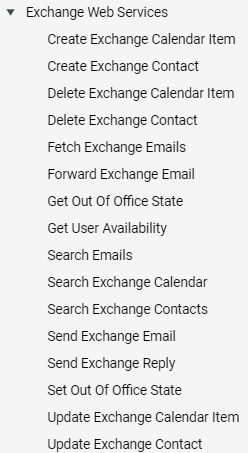 Notes: In response to a Search Emails request, Exchange only returns a few fields in each email result: Subject, Header, etc. The Body and any Attachments are not returned. To get this data, use the Fetch Exchange Emails step. Ids	- an array of email Ids to retrieve full information about, including Body and any Attachments. A common source for this array is the “Id [All Id]” property of the output of the Search Emails step. Notes: Email attachments can be quite large. Avoid using this step repeatedly on the same email Id, if possible, to prevent requesting multi-megabyte file attachments across the network more than once. Body	- the main contents of the email message. Can be plain text or HTML. Notes: The From portion of the email will be the User Email Address in the Exchange Server Definition parameter. Reply To All	- If false, the reply email will be sent only to the From address of the original email. If true, the reply will be sent to all of the original email’s recipients and its From address. This step returns True if the requested user has no appointments during the given time period and False if they have at least one calendar event during that period. Important Note: The “To Date” parameter MUST be at least 24 hours after the “From Date”. Exchange Server will return an error for time periods less than 24 hours. Returns information about any Automatic Replies a given user has set up. Sets the Out Of Office properties for a given user. Search String	- text to search for in the user’s Calendar. Notes: Unlike Search Emails step, the Decisions.Exchange module automatically retrieves all data about a Calendar Item (Event or Appointment) as part of this step. Notes: The Id property in the Calendar Item parameter must be a valid Calendar ItemId for the user in Exchange. This value is set in the results from the Search Exchange Calendar and Create Exchange Calendar Item steps. The Calendar Item Id property must be a valid Calendar Item Id for the user in Exchange. This value is found in the results from the Search Exchange Calendar and Create Exchange Calendar Item steps. Search String	- text to search for in the Contacts list. Notes: Unlike Search Emails step, the Decisions.Exchange module automatically retrieves all data about a Contact as part of this step. Notes: The Id property in the Contact parameter must be a valid Contact Id for the user in Exchange. This value is set in the results from the Search Exchange Contacts and Create Exchange Contact steps. Notes: The Contact Id property must be a valid Contact Id for the user in Exchange. This value is found in the results from the Search Exchange Contacts and Create Exchange Contact steps. One way in Decisions to find out whether new Exchange email or calendar appointments have been created is to write a scheduled job that calls Search Emails periodically and looks for emails added since that previous run of the job. This involves making calls to Exchange even when no new items are there to be found, which increases network traffic unnecessarily. Another method is to create Exchange Event Handlers to subscribe to folders like Inbox and Calendar, and Exchange Event Flows that are run when Exchange notifies Decisions that something has happened in that folder. The Decisions.Exchange module allows you to create multiple handlers and flows so that you can handle these events the way you require. Each handler subscribes to Exchange server events when created, and is automatically re-subscribed at Decisions Services Manager startup time. The Create Exchange Event Handler allows you to define the events you want it to subscribe to, and the Exchange server and credentials to use to connect. The Name	and Description	properties allow you to identify what the handler should be called. The User Email Address	, Password	, OAuth Token	, Exchange Server Version	and Exchange Server URL	properties have the same function as in the Exchange Server Definition used in the Decisions.Exchange module’s steps. 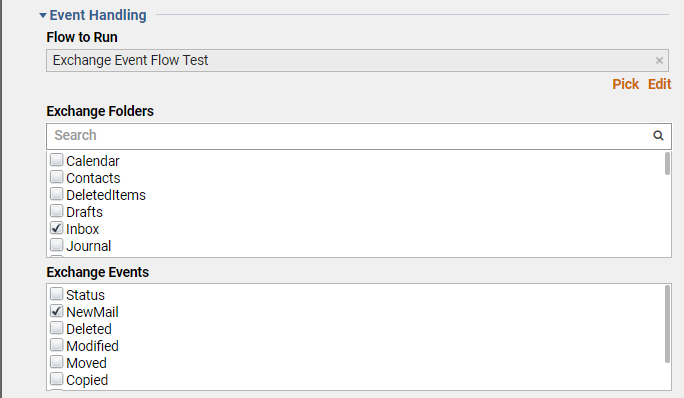 Flow to Run	identifies a flow with Exchange Notification Handler Flow behavior to run upon receiving a notification from the Exchange server. Exchange Folders	lists the folders that this handler should subscribe to. One or more folders can be selected. Exchange Events	lists the events to be notified of in the selected folders. Note that upon receipt of a single incoming email message in the Inbox folder, Exchange server will generate two events: both a Created and a NewMail event. The “Created” event also occurs upon other events in the Inbox folder, so if you are primarily interested in incoming email, subscribe to the NewMail event only. Old Exchange Folder	is the source folder when then event is Copied, etc. Timestamp	is the time on the Exchange server when the event happened. Note: The Exchange server subscription mechanism does not include IDs of new or modified items as part of its event notifications. It is up to flow authors to implement a method to respond to these notifications and request further information about the items involved.